You are using links (sites, … even better, their specific pages) that you find interesting. Your objective is to easily be able to find these pages saved later. Therefore, each link is indexed using tags (keywords: the words that make sense for you) and these tags will be used to find “the” page link that you need. Some users combine even a small explanatory note for each link. But what makes “delicious” interesting is that these lists of links are then available to others using “delicious.” Thus people with similar interests can view and share their best links. With “delicious”, you can identify other people interested in the same subject as you. Indeed, if a page has been recorded by several people, “delicious” indicates it to you : figure on a blue background. Click on this link and you can view the links of other users who share same interests! Very easily, you can add relevant users to your network (add to my network). You will create a network that will gives you access to new links in your field of interest. How to use delicious ? – Click on the tag you want, the list of bookmarks appears. 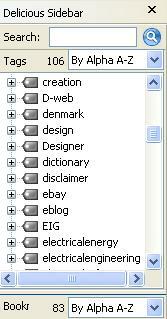 – You can also access alphabetically, but when you have lots of favourites, it is the tag (key word) search which is the best approach. In my case, I am a beginner ; finally it’s not so easy to explain ; I hope i have helped some of you ! your complementary explanations or questions are more than welcome ! or copy this trackback: http://engineering.electrical-equipment.org/engineering-web-tips/smart-bookmarks.html/trackback from your own site. nice article. thank you for your suggestion. Your article is very good. I have learned new thing from your post. I am bookmarking your website.